Praey for the Gods, the game that has drawn interest from gamers for its Dark Souls, Monster Hunter, Shadow of the Colossus look and feel, and the interest of Bethesda for using the title "Prey" in its name (don't worry, it didn't have to change the name in the end) has finally hit early access. After a couple of years of teases and secretive development, No Matter Studios' first game is finally available. 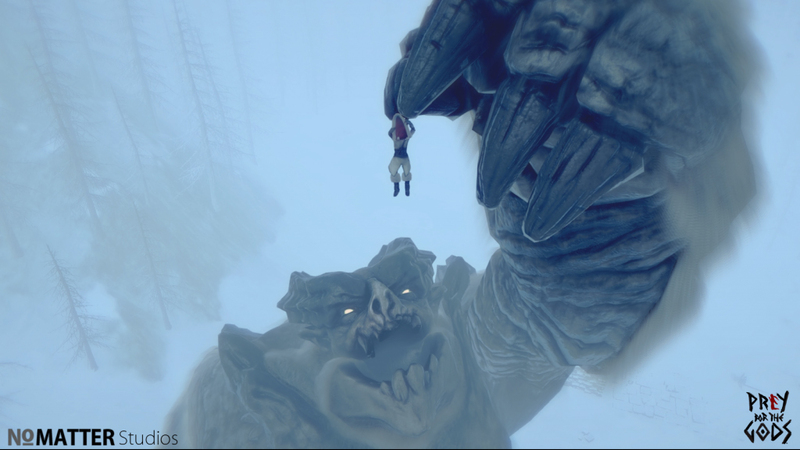 Although the end goal of Praey for the Gods is defeating massive, climbable titans that roam the snowy landscape, that's not where you'll start. The game also has survival elements, low-level minions to fight, and gear to craft. "You'll arrive on a frozen island with only the clothes on your back -- it's up to you to survive. Make fires, hunt for food, and find the equipment you need to make it through an eternal winter," the game's blurb reads. "Nature isn't the only danger, so craft weapons, defeat minions for better gear, and venture into long forgotten caves to discover their secrets. Triumphing over these trials will prepare you for the impossible odds that await." Praey for the Gods was a Kickstarter success story and is developed by just three people in No Matter Studios. It's gone through internal alpha and beta testing and some external testing with Kickstarter backers. It's now ready for a wider Early Access release. If you don't see Praey for the Gods as available on Steam Early Access at this time, you might be ahead of the local timezone. Give it a few hours and it should appear for you too.